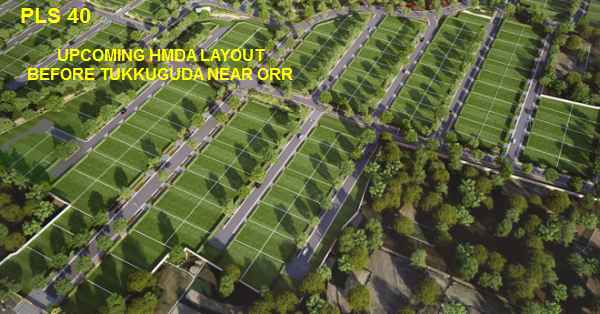 Location: PLS40 Layout is located 2KM before Tukkuguda Junction, beside ORR, near Airport. Premium Location. Drive to Thukkuguda / Wonderla / Adibatla all along ORR only. Upcoming Plot Layout gives you opportunity to book at PRE LAUNCH Rate, just before HMDA Approval, with 3L booking amount. Premium Location from Exclusive Ventures: The project will come up on the leftside of ORR when driving towards Adibatla from Shamshabad. Just 2KM before ORR Exit 14, BESIDE ORR. Being Before TCS and between TCS and Shamshabad and close to ORR, gives it unique advantage and you can expect very good return, just like previous prelaunhed projects PLS29,PLS30 and PLS37 along ORR, where our members have gained huge appreciation. Plot rates in this area in February 2019 is Rs.14,500 to Rs.15,000 per sqd. Rate is moving up quickly as observed during last 6 to 8 months. Prelaunch rate will be just under market rate. However, the buyer need to pay only 3L to get the prelaunch rate, though registration will be after 4 to 6 months. Basically, instead of paying high market rate later, hold the rate by making token advance, by blocking plot. Step 1. Priority List Currently Prelaunch is not open. May proceed with Rs.5000/- token payment and be in priority list. Will alert before layout is Prelaunched to have your plot blocked in advance. Also get the lowest rate . This amount will be adjusted against the 3L advance. Step 4. Pay the rest 60% by self or BANK LOAN at time of registration. BOOKING PROCESS: We are happy to invite you to join this project at PRE-LAUNCH Stage. Please confirm interest by filling in ENQUIRY FORM. We are maintaining PRIORITY LIST. The project is in HMDA approval stage. Expected very soon. The land is in Special Development Zone where all construction and layout activity are allowed.